Port of San Francisco, California – Quint Street Yard Track and Signal Improvements – $2,970,000 to improve an approximately one mile-long spur connecting a Caltrain mainline track to the San Francisco Rail Yard. The mainline is under consideration for use as part of the California high-speed rail project, and the current condition of the spur track limits the frequency, weight and length of trains that can use the track, causing delays. The improvements will allow freight trains to operate at higher speeds and clear the mainline more quickly, significantly reducing delays to Caltrain commuter trains and future high-speed rail trains. JPB additionally explains that the Caltrain 2025 program will temporally separate freight and passenger operations between San Francisco and Santa Clara, CA (Mileposts 0.2 to 44.6). Temporal separation between these mileposts will be achieved by limiting freight movements to the exclusive freight period hours of midnight - 5 a.m.
That's right, temporal separation means that freight trains will not operate in the same hours as passenger trains, making the need to "clear the mainline more quickly, significantly reducing delays to Caltrain commuter trains and future high-speed rail trains" nothing more than a specious pretext. Nice play for $3 million, nonetheless! Temporal separation, by the way, is the best way to avoid the expenditure of millions upon millions of dollars to make Caltrain's positive train control system compatible with Union Pacific freight PTC (and thus, incompatible with the HSR train control system). Protecting the peninsula rail corridor right of way from crowding or outright encroachment, whether by private developers or other agencies, has evidently not been a high priority for Caltrain. Examples abound: a movie theater built right next to the tracks in San Mateo, a "Transit Village" planned right next to the corridor in San Carlos, a Millbrae station that constricts the number of tracks. All of these examples complicate the task of outfitting the corridor for high-speed rail service, and may add tens to hundreds of millions of dollars to the cost of doing so. 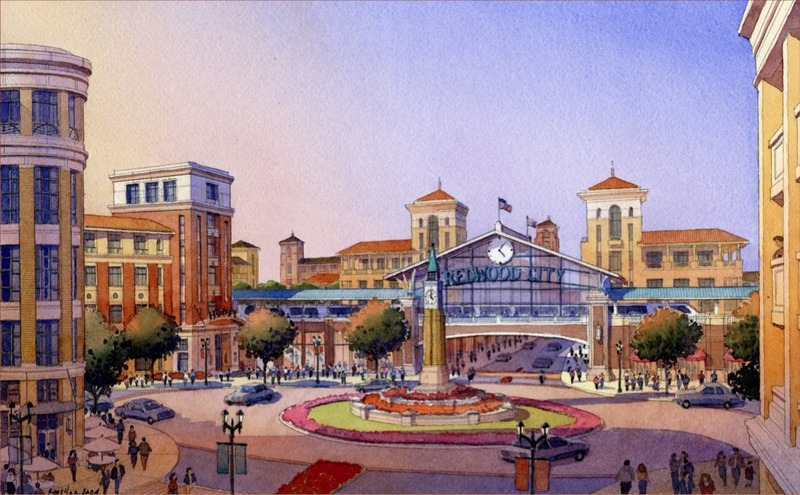 Depot Circle, a large residential/commercial development authorized by Redwood City's recently updated Downtown Precise Plan, threatens to encroach on a vital piece of station real estate in Redwood City. The city recently released a Request for Qualifications that outlines the project and describes its role as a future focal point for Redwood City's downtown. a mid-line overtake location, where Caltrain express trains could exchange passengers with Caltrain local trains, across a common platform. 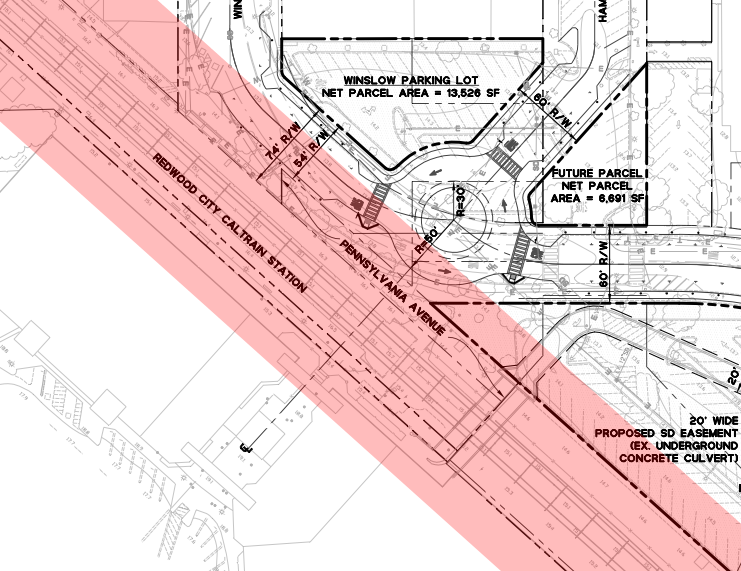 One of the most promising mid-line overtake scenarios now being considered under Caltrain's corridor capacity analysis assumes that four tracks would be built right through the Redwood City station. The Depot Circle RFQ asks prospective developers to address the rail corridor issue only tangentially, without offering specific design constraints: "Describe your strategy for dealing with the potential widening of the Caltrain railroad to accommodate High Speed Rail. In particular, explain how far, if at all, would you set the project structures from the current railroad, and any other site design strategies that might be employed to minimize effects of a potential future widening of the railroad." What are developers supposed to know about railroads? A four-track elevated station with two island platforms will be at least 125 feet wide (if built as narrow as possible), more than 200 feet wide (if built to the CHSRA's elephantine station design standards), and over a quarter mile long. A four-track underground station, however unlikely to be built because of the astronomical price tag, would need even more space to accommodate temporary shoo-fly tracks during construction (30 feet), space outboard of the trench walls for construction equipment movement (15-20 feet each side), as well as clearance for trench wall tie-backs that can't interfere with nearby building foundations. Even if the station were moved north or south from its current location, away from Depot Circle, the tracks would still need to spread apart gradually (in conformance with the track alignment standards) and would occupy a wide swath well before and after the station itself. The upshot of all this: including reasonable building setback clearances, a prospective developer should make an allowance of at least 150 feet for the future expansion of the rail corridor. 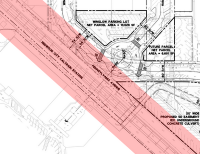 A 150-foot corridor is shown overlaid on the Depot Circle parcel map in the graphic at left (see also overlay on original map, 1.1 MB PDF), and takes a significant bite out of the parcels now offered for development--including the project's namesake traffic circle. If Redwood City wants to become what Palo Alto could have been, it's time for the city, Caltrain, and developers to make the station itself the focus of downtown, provide it with enough land, and build it to be as architecturally striking as the elevated Amsterdam Bijlmer Arena station. If there isn't enough vision to do that, please just avoid hemming in the rail corridor.